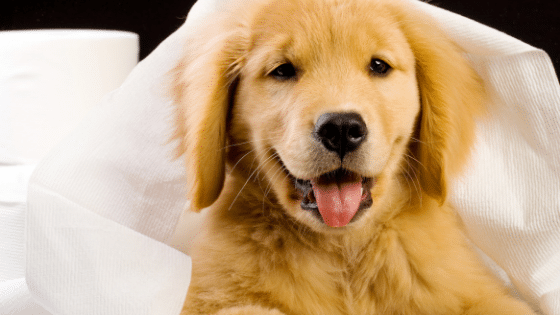 Bringing a new dog or puppy home is exciting for everyone in the family, but chances are you’re concerned about how to potty train a puppy or new dog and how you’re going to keep your carpets and rugs clean and stain free. Potty training can feel like a daunting task, but with persistence, consistency and a little patience you can make the process quick and easy. Check out our steps below for house training your new pup. Consistency and creating a routine are some of the most important aspects of house training a dog. You’ll need to create a feeding schedule to help you stay on track, as dogs typically need to use the bathroom about 10-15 minutes after eating. By creating a routine, you’re teaching your dog that the day is broken up into times of eating, sleeping, play and potty. You may also want to take away their food and water dishes a few hours before bedtime. If their tummy and bladder are empty, you’ll reduce the chance that they’ll have the urge to go in the middle of the night. Pick an area of your yard or neighborhood to be their designated potty spot and take them to that same spot each time they need to go out. Also, choose a phrase you want to use, such as “let’s go potty”, and repeat that to them when they’re outside and making an elimination. This can help remind your dog of what the need to do when they’re outside, as the sights and smells can easily distract them. Keep treats on hand and be sure to reward them with a snack and lots of praise after they successfully go potty. Many times, you can tell when a dog or puppy needs to use the bathroom simply by their actions and body language. They will typically sniff at the ground when they’re outside and ready to go, but there are some other signs to look out for. Watch for things such as pacing, walking away from play, and distracted behavior. These are some subtle signals that they need to go potty, so get the leash on and take them out right away. Crate training is often used for potty training because dogs don’t want to soil their dens. It’s particularly useful in the beginning stages of housetraining when you’re away at work or school and unable to keep all eyes on them, but it’s important to keep a few things in mind when using this method. Puppies aged 6 months and under should not stay in a crate for more than 3 to 4 hours at a time. They don’t have the ability to control their bladders for that long. With dogs of any age, keeping them in a crate for too long doesn’t allow them to get enough exercise and human interaction. This can lead to a bored, anxious or depressed dog. If your home is empty for extended periods of time during the day, think about hiring a pet sitter to reduce the amount of time spent in the crate each day. They can come over and take your dog outside and give them some much needed play time. If you plan to be gone for an extended period of time, hire an Elk Grove pet sitter to come to your home and give your puppy a potty break. On average, puppies can only ‘hold it’ for the number of hours that equals their age in months. For example, if your puppy is 3 months old then they can hold it for 3 hours. A pet sitter can also play with your puppy so they don’t get bored. Accident do (and will) happen. If you catch them in the act, take them outside to finish up. If the damage is already done and you’re just finding it, don’t bother scolding them as they won’t understand what they did wrong, and the opportunity to correct it has passed. The traditional advice of swatting the dog or rubbing their nose in their mistake does nothing to make the potty-training process any better and does not help your dog to understand what went wrong. These behaviors can actually damage your relationship with your dog in the long run and will just make your dog afraid to go near you. Consistency, kindness, patience and positive reinforcement go a long way when training your new family member, and the time and effort put in will be worth it in the end!